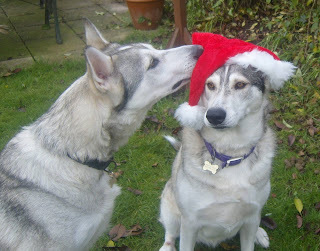 Can you think of a funny caption for this photo featuring Kodi and Kaya, Northern Inuits. Best caption wins a Dog Traning Kit for Dummies courtesy of the Company of Animals and five runners up will win a Marrow Ring. Email your captions to comps@dogstodaymagazine.co.uk or go to our Dogs Today facebook page and share the fun and read others ideas for inspiration! We'll be judging tomorrow at 1pm! So hurry.